One of the greatest warriors of all times, Alexander the Great, had a tryst with Sindh, where his initial luck turned sour and his army received its first ever mauling. . . . . . . If anyone were to rule the world, it was thought it would be Alexander the Great, the Greek warrior who struck terror worldwide during his reign. Tales of Alexander and his feat, are inscribed in history books and he is revered as ‘the world conqueror’ who ‘came, saw and conquered’ every land he had visited. His rendezvous with India’s Porus (Puru) still runs across pages of the Indian history books. But what goes unmentioned is his attempt to capture territories in Sindh and his army’s failure in achieving the feat. Records reveal, that the Greek warrior, in his quest to conquer the world had skirmishes across the Middle Eastern Gulf. His wars against Iran, Afghanistan and India had earned him a number of foes and so petrified was he that he was reluctant to even return by the same route that he entered through. If historical records are to be believed, Alexander had a modus operandi set to vanquish the reigning rulers in Sindh and India. Prior to his entry, his spy army was all across the Sindh and the Gangetic plains surveying the region to the last detail. These experts had a detailed report made on the geographical conditions and had even measured the distance between the Sindhu valley and the Gangetic plains till Patliputra (Patna). His urge to capture Sindh stemmed from his records of the region, which was supposedly a storehouse of fabulous treasures and the riches that the inhabitants had amassed after year of toil. His entry into Sindh wasn’t difficult and his army ravaged through the neighbouring territories, setting their foot on Sindh. 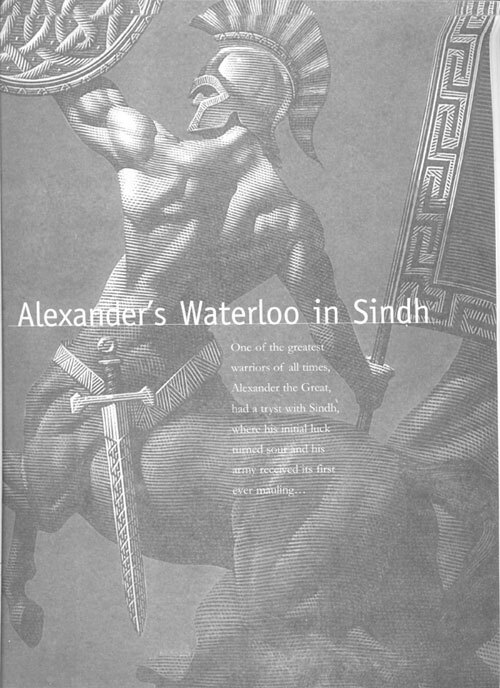 Alexander’s hordes invaded Sindh with the novel wary cry ‘Alalalalalai!’ The Sindhis were obviously jolted by the Greek’s war cries and their aggression, but nevertheless fought back with equal vigour. The reisitance, one of the toughest the Macedonians had ever encountered made the monarch angry and wherever he was resisted, he plundered the inhabitants wealth, massacred them and even destroyed their flourishing towns. His operational force went about building bridges for the army to cavalcade across territories, the famous one being the ‘Simander-ji-Pul’, the bridge of Alexander that was constructed in an attempt to enter the Alore province (then called Musicanus). Alore (of Alwar), that had remained the capital of Sindh for more than a thousand years, was the richest place in the whole of the sub-continent at that time. The rulers of this place, the Sodha Rajputs put up a valiant fight but couldn’t hold back against the strong army of Alexander. After defeating the Rajputs, the Greek army went about on a killing spree, massacring all inhabitants and leaving the city in ruins. The next destination of the Greek army was Sehwan (then called Sindemana), a flourishing town on the banks of the Indus river. A Brahmin king, Sambhos who ruled Sehwan accepted the rule of the Greeks, but the residents of this town rose to the occasion and refused to open the gates of the forts to the Greeks. Irked by this, Alexander vigorously fought the resisting battalion and after the conquest ordered the killing of each and every Brahmin. By that time the Greeks Became aware of another town, in fact a rich port, Patla (now Hyderabad) near the river delta. The Greek regiment marched towards this won and on hearing the news, the king of Patla agreed to the suzerainty of the invaders, but as the Greek entered the land, the king fled his palace to take refuge in Kutch. Humiliated by this even he looted the place and killed all the Brahmins there. Notes H. T, Lambrick, a former commissioner of Sindh, and author of the ‘Sindh before Muslim Conquest’: “There was a subtle power in Sindh which created the will to resist the foreigner, the influence of the Brahmins.” Alexander never excused the Brahmins for persuading the Sindhi kings to run for cover. However, he was so impressed with the intellectual prowess and spirit of the Brahmins that he captured and kept with him ten of them. However, unfazed by all the resistance he continued with his conquest and the Greek monarch marched across the territories of Sindh vanquishing all rulers and capturing almost every town. His army also reached the place where Karachi stands today and called it Sikander-jo-Bihist (Alexander’s heaven). But his army’s honeymoon in Sindh was about to come to an end. 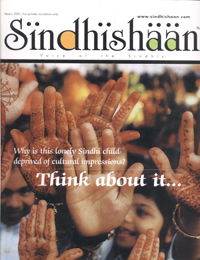 In his campaign to conquer the entire Sindh, he touched upon the mighty river, Indus. Amusingly, he mistook it for the source of river Nile, because of the presence of crocodiles! With great fanfare, his army sailed down the Indus in hopes of reaching Egypt.